Numerous possibilities in different materials and techniques depending on your application. 3D scanning / different 3D techniques. Technical drawing / 3D modelling in several software packages. Support and customization throughout the entire workflow from concept to finished product. Support and advice for purchases, design, techniques and materials. We intend to offer progressive and innovative products and services. Quality is our main priority. Your question is our challenge to find the right application. 3d4all is been in business since 2014 based at Ghent (East Flanders). Our activities include 3D printing, 3D imaging, product design, rapid prototyping, product engineering. We offer consultancy and customization for the development of an existing concept or creation of a new product. The confidentiality of your project is guaranteed. You can submit your ideas in good faith to us. We are your contact point for al your questions about imaging, digital visualisations, technical designs and prints of your objects in different materials. 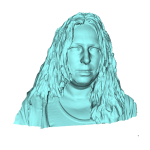 With our own developped full body scanbooth it is possible to scan a person in a tenth of a second to a 3D model. From this model we can print a full colour statue in different sizes. The possibilities in 3D are evolving very rapidly so we follow this very closely. We intend to offer progressive and innovative products. Quality is our main priority. We offer 3D prints in different materials (composiet (full colour or white), ABS, photopolymeres, metals, polyamides, …). We advise you on the characteristics of these products to help you chose the right material for your project. Preliminary consultation to achieve the right result is very important. You can meet us by appointment or if desired we come on-site. For a project assignment you can send us a call for tender. For 3D prints we charge a fixed unit price per volume (depending on the material and the duration of the print). If no detailed model is available the pricing is based on a guide price for the estimated volume. Creation or editing a 3D model is invoiced at an hourly rate for technical design. If a 3D model is needed to come (on your demand) to an accurate tender this cost wil be charged. 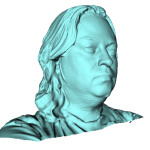 Prices for 3D scans depend on the complexity of the scan. Scanning on-site is possible at an extra charge of kilometric allowance. Be free to contact us for further questions.